NASA presented promising evidence on Monday that future exploration missions to Jupiter Moon Europa will not have to drill through a Kilometers-thick ice sheet to reach what is considered the Holy Grail of planetary science – liquid water on a foreign world. The Hubble Space Telescope images delivered compelling evidence for plumes of salt water being ejected from smallest of the four Galilean Moons, fed from a large underground Ocean that may be providing an environment suitable for harboring organic chemicals or even primitive forms of life. These findings are likely to fuel the development of upcoming flyby missions to obtain a direct sample of the watery ejecta. A potential detection of plumes on Europa was first reported in 2012, however, the studies of the phenomena are right on the edge of Hubble’s sensor capabilities. Therefore, scientists are careful in their conclusions, though statistical measurements provide a very strong indications that the phenomena seen in 2012 and 2014 indeed correspond to actual water plumes from Europa. Europa, slightly smaller than Earth’s Moon with a radius of 1,560 Kilometers, consists of an outer layer of water, possibly 100 Kilometers thick with a hard icy surface, followed by a solid silicate zone and a metallic core. 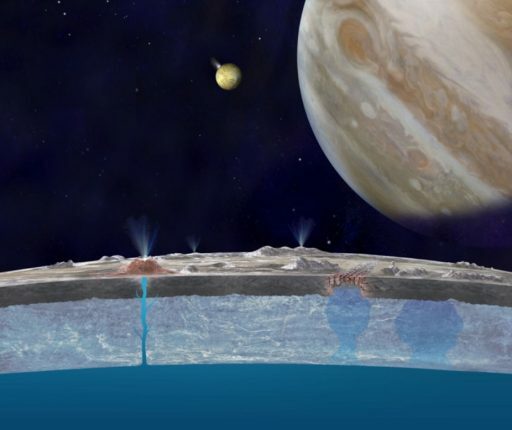 The consensus among scientists is that a global ocean of liquid salt water lies below several Kilometers of ice and is maintained in a liquid state due to tidal heating caused by Jupiter’s massive gravitational field and Europa’s eccentric orbit. One question scientists still debate is how deep the subsurface ocean lies beneath the hardened water ice surface. Per the Thick Ice Model, the outer crust of Europa may be two dozen Kilometers thick followed by a warmer ice layer which would mean the liquid ocean may be about 100 Kilometer deep and only very rarely interacts with the surface. 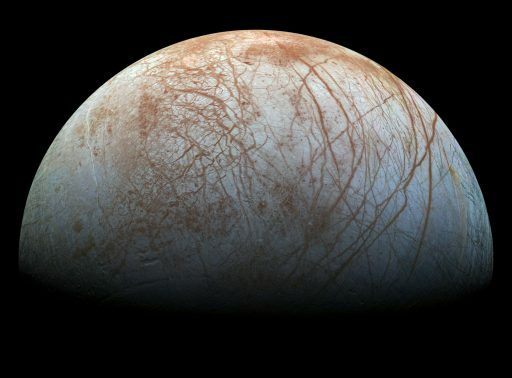 However, evidence seen on the surface provides clear suggestions that regular ocean-surface interaction may be taking place, as seen in Europa’s ‘Chaos Region’ where scientists believe the ocean may have melted through the crust, indicating it may only be a few Kilometers below the surface, on average. In 2012, Hubble data provided the first signs of plume activity on Europa showing a plume of up to 160 Kilometers erupting near the south pole. Spectroscopic observations conducted at the time found auroral emissions from hydrogen and oxygen, adding strong evidence that water was being released from Europa. However, the measurements pushed Hubble’s resolution leaving some doubts that what was seen may have been artifacts. Follow-up observations to the possible 2012 detection found no plumes emanating from the moon, suggesting that – if existent – the plumes only occur periodically, possibly tied to seasonal variations. The observations published on Monday were conducted in 2014 using transits of Europa across the brighter backdrop of Jupiter originally designed to search for a thin atmosphere surrounding Europa. In the transit images, very faint finger-like projections or protuberances can be seen rising from an area near the south pole, a similar but not identical position to the 2012 findings. 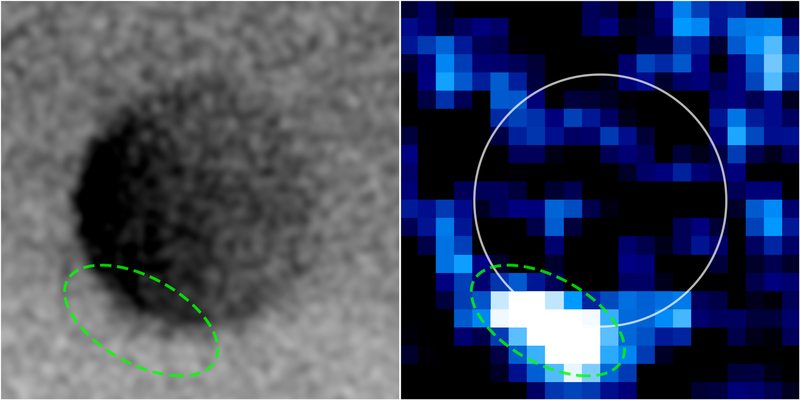 Indications of plume phenomena were found in three of ten transit images in the form of off-limb features that are in agreement with plume activity. While statistical evidence strongly suggests the plumes are real, scientists are still careful in their statements and more images are currently under review to asses the plume’s presence in more recent data. 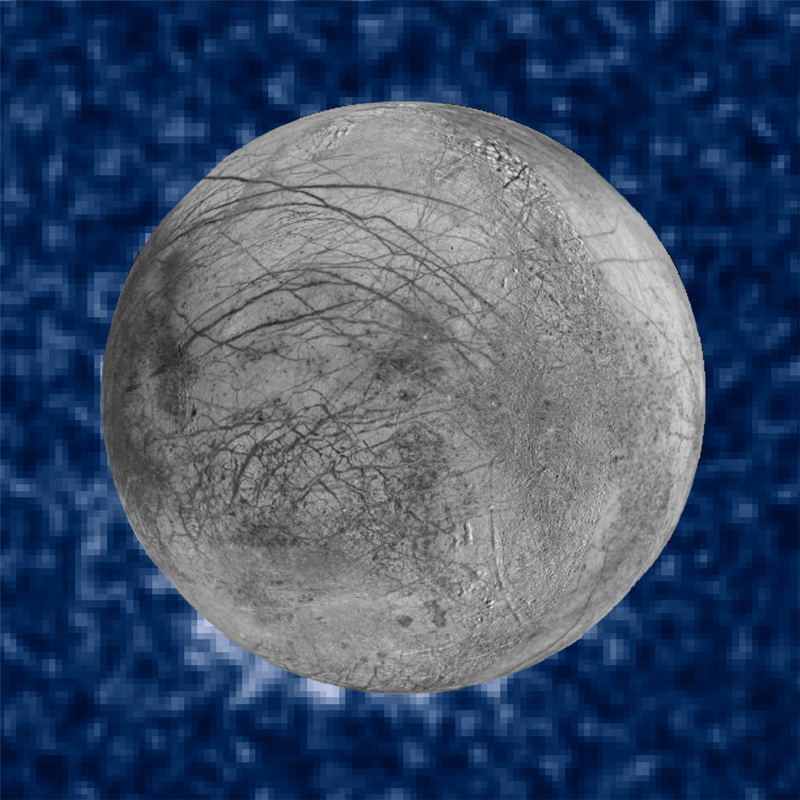 If the plumes prove out to be real, they will offer very easy access for future sampling missions setting out to analyze Europa’s water for hints of biological activity or the chemical ingredients of life. Plumes rising to 200 Kilometers would enable a spacecraft to fly through and obtain samples of the water released from the underground ocean without having to land and penetrate the thick icy surface. To arrive at a firm conclusion on the presence of water plumes on Europa, scientists will be eagerly awaiting the first measurements of the icy moon by the James Webb Space Telescope that will offer an unprecedented infrared vision to reveal any sizeable plumes on Europa. The $8 billion JWST is currently expected to lift off in October 2018. 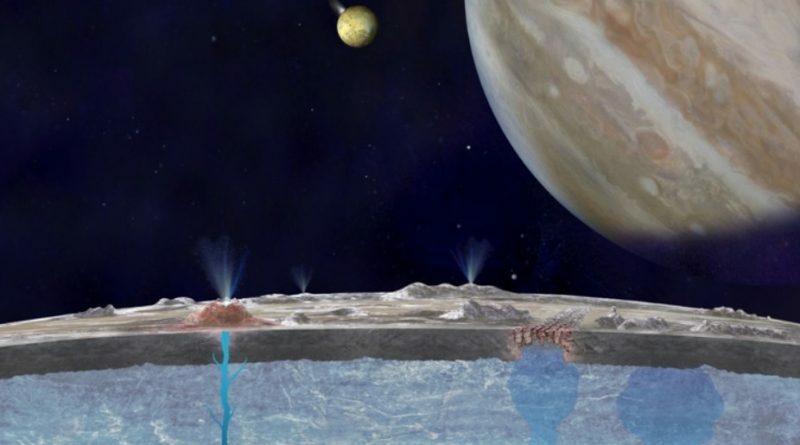 Because Europa is one of the most relevant targets for astrobiological research, there are a number of missions in the early stages of development that could deliver measurements of water in the plumes. NASA’s Europa Clipper, now mandated by U.S. Congress, is expected to take off in 2022 or 2025 atop the Space Launch System to complete a relatively short two-year cruise to its faraway destination where it will fulfill threefold objectives looking at the ice shell and ocean, the composition of Europa and its geology & evolution. Europa Clipper sets out to provide unambiguous confirmation of the existence of the subterranean ocean and specify its depth below the ice sheets, further studying possible surface-ice-ocean interactions. The mission design calls for the spacecraft to enter an elongated orbit around Jupiter that sets up 45 flybys of Europa at varying altitudes from 25 to over 2,000 Kilometers, studying a different sector of the moon with every close pass. Instrumentation selected by the mission cover plasma sensing instruments, magnetic detectors to probe the interior of Europa, different spectrometers to look at the moon’s chemical composition, imaging systems to deliver high and medium-resolution photos of the icy surface, sounders to penetrate the surface and measure the thickness of the ice crust, and a specialized instrument to sample particles ejected from Europa to identify organics, even at trace levels. 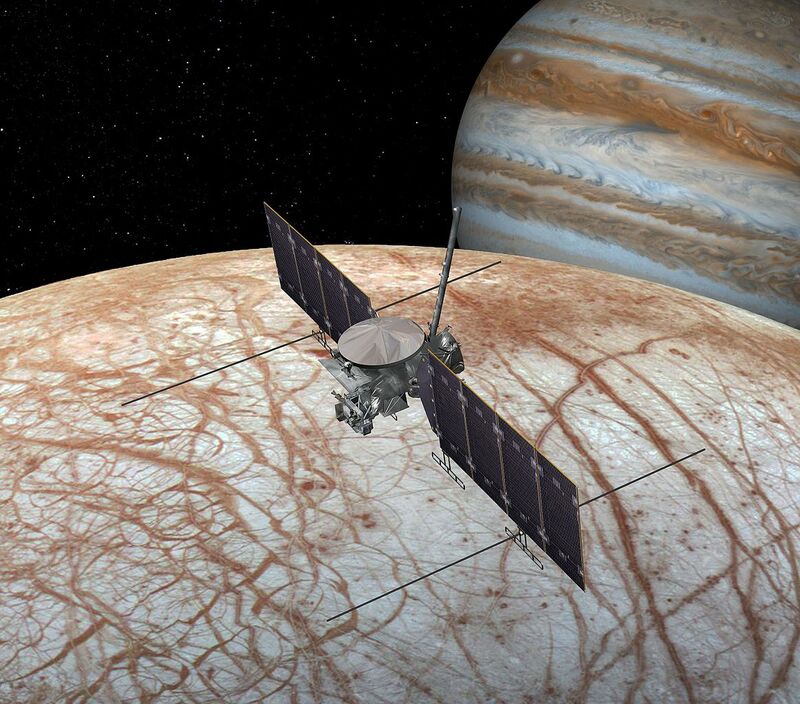 Europa Clipper will dispatch the first ever lander to operate on one of the Jovian moons to capture valuable data on the composition of the surface near an active area. If possible, scientists will likely aim the lander for a site near an active plume to gather data on possible astrobiologically-relevant compounds. The mission proposal also included ideas for the deployment of small Nanosatellites specifically setting out to sample the plumes. Monday’s announcement may lead to a re-visit of the proposal to maximize the scientific turnout of a mission to one of the most promising scientific targets in the solar system.